If you follow my reviews, you'll remember I like the entire idea of Bluetooth speakers, which seem to be the equivalent of my old boombox from the 1980s. In the old days, if you wanted to carry your music out to the backyard, you'd unplug your boombox and make sure all 12 of the D-size batteries were loaded up. You either played a cassette or listened to the radio, although my later models did have a CD player. Well, music has made a transition from cassettes, CDs and FM radio to smartphones, MP3s, Pandora and Spotify. We have all the music sources we could ever want, and it all originates from our phones, which have tiny speakers. For a while, it seemed speaker docks were the way to go. I had several for iPods and iPhones that had a 30-pin connector for your device, which had to stay in the dock to provide sound. Advances in streaming technology meant we could send the music from our phones to a properly equipped Bluetooth speaker system. Now getting the music outdoors is as easy as tossing a Bluetooth speaker in your beach bag. I've tested and owned plenty of Bluetooth speakers, and I've been happy with most of them. For the last few weeks I've been testing the Turcom AcoustoShock Wireless ($129.99), and it has the distinction of being one of the larger Bluetooth speakers I've used. I'm not saying the AcoustoShock is too big - it measures 10-by-3.8-by-4.7 inches and weighs just over 3.5 pounds. But it's not going to disappear into your purse or gym bag. It's pretty substantial. 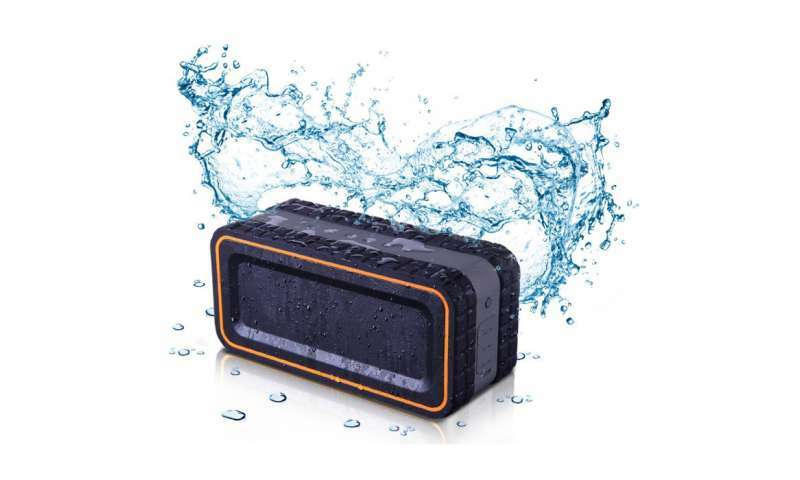 The AcoustoShock is made for the outdoors - it has a rating of IPX5, which means it's water-resistant against a direct spray or splashing of water. Just don't dunk it completely. Also, the charging ports on the side are protected by a small door, which must be secured to provide the water resistance. The AcoustoShock is surrounded on each side by an inch-wide band of knobby rubber. It's shockproof and dustproof as well. I dropped it onto a carpeted floor from a height of 4 feet, and it suffered no damage. The top has a row of inset buttons for playback and volume, while the side panel has the power button, an aux-in port, a charging port and a USB port so you can charge your phone from the AcoustoShock's 8,000 amp-hour lithium-ion battery. The AcoustoShock can charge a typical smartphone at least three times. The battery will also keep the AcoustoShock playing for up to seven hours. It uses Bluetooth 4.0 and has a range of up to 33 feet. If you receive a call while your phone is paired to the AcoustoShock, it will allow you to take the call, acting as a speakerphone. You press the play-pause button on top to answer or hang up a call and use the built-in microphone to speak. When you're done on the phone, the music continues automatically. Finally, to make carrying it a bit easier, there's a retractable handle on one end. The AcoustoShock has two 2.75-inch-diameter drivers with a 3-by-2-inch subwoofer, and the sound is pretty good for a single speaker. I took the AcoustoShock to a family reunion last weekend where I was in charge of the music. I used it to stream music from a Bluetooth-enabled iPod, and it was loud and clear enough to provide background music for a very large meeting room. My wife is a preschool music teacher, and she uses Bluetooth speakers every day in her class. The AcoustoShock would be a good choice for her, as she can keep it playing all day on a charge. And if it gets knocked off a shelf, no harm done.